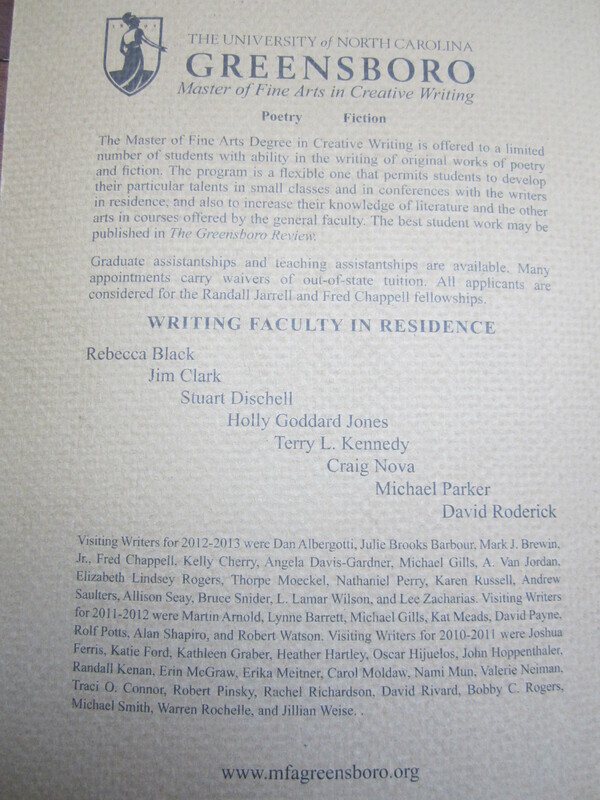 The University of North Carolina - Greensboro's Master of Fine Arts in Creative Writing publishes a poetry and fiction review called The Greensboro Review. I happened to read the Fall 2013, Number 94 issue, having received a copy only because I paid a small fee to have my own fiction submitted to the review. The University of North Carolina – Greensboro’s Master of Fine Arts in Creative Writing publishes a poetry and fiction review called The Greensboro Review. I happened to read the Fall 2013, Number 94 issue, having received a copy only because I paid a small fee to have my own fiction submitted to the review. What I can tell you is that I would have rather saved my money and my submission than receive another publication from this MFA program. But let me also add, before I get started, that I once took the course ”Current Problems in the Middle East: An Historical Perspective” with Dr. Ann Saab at the University of North Carolina-Greensboro; so this university is somewhat like one of my many other alma maters that I consider fondly and with much respect. The problem I find with many MFA communities, however, is that certain writers get together and begin to favor one type of writing over another – hence the subjective tone of so many rejection letters – rather than trying to honestly seek and publish the best kinds of writing in the country, and even in the world. Publishing is subjective, but what is happening is that reviews are struggling with readership and they blame it on technological progress. There is great writing out there to be discovered and published. The Greensboro Review published only a few snapshots of that greatness and relied heavily on past credentials of writers in their community rather than the final product being published. This type of syndrome, which I will call the NC-Greensboro Syndrome, in publishing is far more prevalent than anyone knows or understands. What the typical process is, especially in an MFA program, is to submit national advertisements to seek new writers and new talent for possible publication and then charge a small fee which is usually equivalent to the same price of buying the review. In all honesty, this is one symptom of the NC-Greensboro Syndrome: if readership is down, then dupe writers into paying for a reading fee for their submissions, which is never read or heavily considered by the editors, and then publish primarily from a list of more published candidates who have special connections (i.e., network here is key to the failure) with the program, the editors, and the community of writers in that specified region. So let’s look at the quantitative data before we move to the qualitative. Out of the 18 writers published 11 of those writers had connections to the East Coast (that is 61%) and out of those 11 writers, 5 writers were connected to the Carolinas (that is 45% – almost half). The remaining 7 writers (about 38%) came from places like California and Ohio, and one writer from Texas (hook ’em horns!) and one from Chicago (Chee-kaa-go!). So what we have here with the NC-Greensboro Syndrome is (a) the editors chose 61% of writers from the East Coast; (b) almost half of those were connected to the Carolinas in one way or another. Meaning: Non-East Coast writers/readers need to think heavily before spending any money on submitting to East Coast journals and reviews. This community, in many regards, shares interests and a unified culture of tastes and will be more likely to reject any submission outside of their traditional preferences, and rely more on networking and private connections. This is a bastardized version of nepotism. The quantitative data speaks the truth: if you are an East Coast writer, take the chance and submit, but keep in mind that out of 61% of East Coast writers all of them were well-published, won awards, and/or were teaching at the university level. The first sign of the NC-Greensboro Syndrome is when reviews and journals publish heavily from their own communities [i.e., the quantitative data speaks for itself) and ignore far better talents and more worthy submissions that originate from outside of the local and normative regions. The second sign of the NC-Greensboro Syndrome is when reviews and journals publish heavily from credentials rather than actual output and the quality of such materials (i.e., the qualitative data). 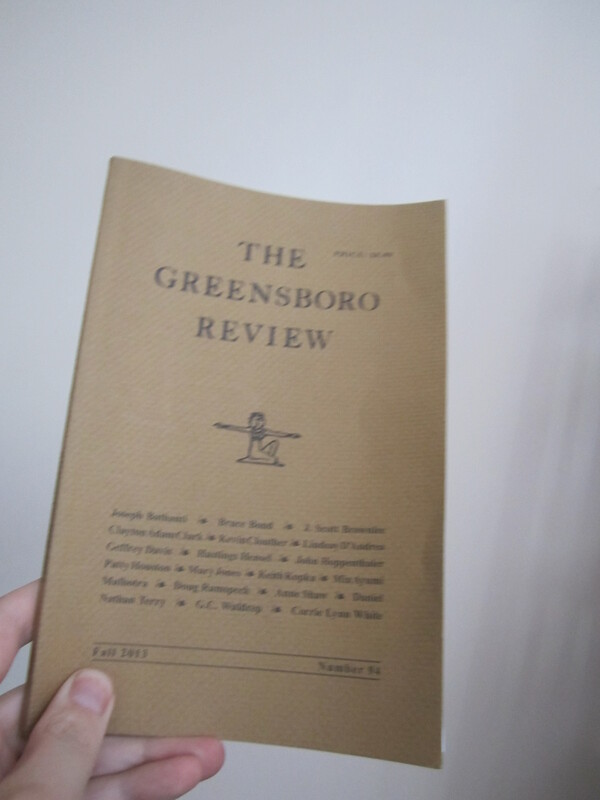 As for my cultivated tastes that have traveled around the world and lived in several countries, I found this issue of The Greensboro Review to be horrid and its vision was absolutely lost on the editors’ expectations that very likely believed the writers’ credentials would carry the published pieces alone. That just doesn’t work in literature. Editors working for journals and reviews, which are struggling to survive, need to become sensitive to this important issue between past merit and current performance. Certainly some writers have the awards and publications that lead to the merit of past performances but this does not lend itself to the quality (hence qualitative) of new published materials. And I firmly believe this is one reason why such reviews and journals are closing their doors to save on print costs and seeking cheaper alternatives, such as cutting down the time spent on the editorial process and switching to a more e-based format. Avoiding the real issue of success (i.e., publishing quality writing) is the second sign of the NC-Greensboro Syndrome. First, ”the makeup bag perched” is the writer trying too hard. A bag doesn’t perch. A bird certainly does. And the writer here is making no connection between the man or woman that visited and some delicate object, and we know this because of the preceding line that explains the removal of all trace of visitation. Second, the use of ”otherwise spotless” is unclear and doesn’t lend itself to credibility of narration or the tone. Strike out ”otherwise” or rethink the image. Third, the mention of such an image of ”a striped pink sock draped” is cliché and overdone. And why in the hell is a sock draped on a towel rack? The image provokes more questions than it does emotions. First, what in the hell happened to the poetry of Keats, of Coleridge, of Frost, of Dylan Thomas, of Bukowski, of Billy Collins? Do we have to continue reading such poetry as found in The Greensboro Review? Let’s and see what happened. A person climbs the edge of the toilet. Not likely. And this is an awkward image rather than one that is seeking in tone and content a more iconic image. The key word ”perch” would have been perfect here, but the writer used it in the sentence above and moved forward with his hands tied behind his back. Second, ”about bones and Costa Rica” is mawkish and too vague. Need I say more? Third, ”I hear pieces of gravel popping” – really? This is a true sign of a poet falling far too short of the great voices that echo from the past and into our pages. And yet, this is what is published as being the best type of poetry in the United States under the perception of the editors working for The Greensboro Review. I, for one, expect better. you complained. I read aloud from Rilke. turn away, and do not build their nests. From reading this section of the rather very short poem (only 13 lines in 5 stanzas) a reader would not believe that Hensel is an author of a chapbook of poems. Starting with the end of the poem: first, it does not strike a concrete image and it is quite redundant with the use of ‘end’ and ‘endless’ which is divided by the very cheap and lazy word ‘seem’. In addition, it sounds like a line an adolescent would write in high school, and I would expect many still do. ”This illusion painted for wasps” is an abstract image and serves no purpose in the concrete, visual world. The preceding line does far better: ”that scrambled the porch ceiling blue.” And the adjective ”infinite” is dated and one word a teen far too often uses to describe his love for his ”princess”. Again Hensel falls into the trap of words meaning far too much in the abstract world and not enough in the concrete one. He writes ”and we both flew”. Really? How did that happen? Here the writer is being far too lazy with his words and it shows. More effort in producing a far better action in concrete and abstract language would serve the quality of the poem much better. But the writer, as many do, seek the easy way out. Writers of today want to work less and be celebrated more. Writers of today simply do not want to do the work of those writers found one or two hundred years ago. Not the best from a Poet Laureate of North Carolina. So we start by looking at ”robes of sooth” which basically means ”robes of truth” and has no basis for being in the poem other than to sound fancy, sound archaic (which it is) and add a level of heightened religious zeal (which it fails at doing). The reader can also notice this weak attempt at religious zeal with the following phrase ”dogwood berries bleed.” By forcing onto the reader the very word ”bleed” the writer fails at placing on the image a natural significance. The image, therefore, becomes frail, adopted, and stifling. And to top it off, the writer breaks up the beautiful phrase and natural rhythm found in ”dogwood berries bleed” to produce: ”dogwood berries / pause / bleed”. ”The Feast of Assumption” is the setting for the poem and these kind of religious metaphors and visuals are over-played and dated. This image might have worked in a poem written in the 1950s, but it doesn’t pass muster in today’s 21st century. All of these words such as ”Friday” as in ”Good Friday” and ”the Blessed Mother” is a poor attempt by the writer to self-create a mythological ambiance to the context and content of the poem rather than relying on the images to do these for him. We have all the words before us: robes, tent, locust, smoke, praise, Stigmata, wood, bleed, Friday, feast, blessed, mother, body, soul, Heaven, land, valley. However, these words are stuffed down the reader’s throat, force fed to the point of vomiting the image back out as unnatural and uncouth; and all are found in the span of three small stanzas. To be brief and sum up, the Fall 2013 issue of The Greensboro Review had a multitude more of these lower quality and poorly produced poems than the few examples I have presented here today. My advice: don’t waste your money in submitting your works of writing (you’ll only get rejected if you are from the outside of the community), and don’t waste your money on buying a copy of the newest issue (many of these sorts of publications rely too much on a writer’s past credentials rather than quality in the here and now). And these are two of the signs of the NC-Greensboro Syndrome. If you expect the finest quality of writing in the country, you will be let down. From The Greensboro Review, expect some roughly hatched publications from some overly feathered writers.